Sugilite is a rare potassium sodium lithium iron manganese aluminium silicate mineral. Its form is usually massive, although rarely it forms in tiny prismatic crystals. The mineral was name after Japanese geologist Kenichi Sugi, who discovered the first specimens in 1944. The colour ranges from pale lilac to deep purple. A magenta-purple shade is considered most precious, especially in the translucent form known as ‘gel’. Although Sugilite has been found in Japan and Canada, almost all Sugilite on the market comes from very deep manganese mines in South Africa. Sugilite is considered to be a powerful stone for opening the third-eye, crown and etheric chakras. It may activate the heart and mind, assisting one in finding one’s true spiritual passion and following that passion to abundance and wholeness. 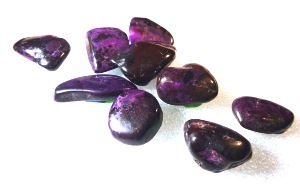 Sugilite is said to help one believe in life’s possibilities. It may help one envision something other than what is currently being experienced, offering hope and optimism for a better future. 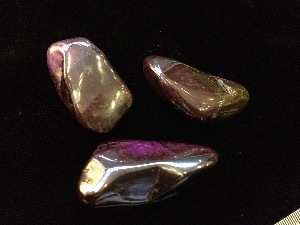 Sugilite is believed to aid in repelling negativity and in fillings one’s aura with high-frequency Light.